Due to certain geological conditions there are a large number of springs located around the Rathcroghan area. 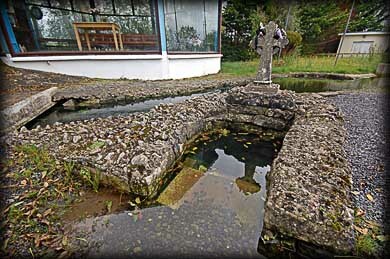 Probably the most famous of these being the spring at Ogulla. 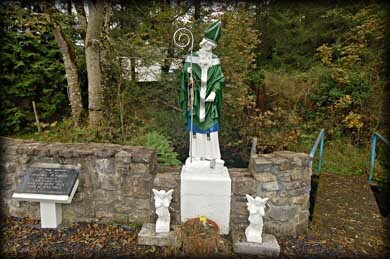 This is believed by many to be the Cliabach Well where St Patrick baptised the pagan princesses Eithna and Fidelma, daughters of the High King of Ireland. Although some believe the Cliabach Well may be one north of here at Toberrory. There is a Rag Tree and a modern Shrine also present at Ogulla. During my visit a tour guide from the Cruchan Aí visitor centre was conducting a tour for local school children. Situated: Take the M5 to Tulsk. Then turn left onto the R367. Take the first right. The well is 150 metres down here on your left. Discovery Map 33: M 8179 8019. Last visit Sept 2011.